Best Trampoline Reviews 2019 – Bounce Up and Around! Are you ready to bounce off some of those pounds? Eager to get your kids off their tech devices and back outside where they can exercise and have fun together? Whether you’re looking to increase your vitality, lower your stress levels, get your kids back to being kids, or even amp up your sporting career, we have found the best out there when it comes to trampolines. We’ve taken a look at some of the best trampolines on the market today, organized into different categories, each with its own characteristics and intended for different purposes. So, even if you’re not planning to break the world record of 10 backflip jumps in 7 seconds, keep reading, because we’re pretty sure we have just what you need. The chart below should help you narrow down your choices so that you don’t have to read every one of the detailed reviews further down on this page. Instead, you can home in on those trampolines that best fit your budget and intended uses. Its built-in basketball net adds an extra element of fun to your trampolining experience. Though the springs are reinforced and rust-resistant, there aren’t as many of them as on other trampolines of similar size. The attention the designers paid to both fun and safety makes this a solid option for people with children. Sturdy construction and long springs mean that it will last a long time while continuing to create great rebound for high jumps. Its weight limit is much less than one would expect from an advanced trampoline. At this price, you’ll be hard-pressed to find a better trampoline if a high bounce is important to you. The padded handlebar and elastic-based spring system make this one of the safest trampolines for small children. It has only a 100-pound weight maximum and small jump surface, which means that multiple children will not be able to use it together. A good choice for parents who want to let their toddlers bounce safely for entertainment and exercise. This trampoline has the best safety and stability features of all the intermediate-level trampolines on our page. Its springs seem to be a little shorter than those of some other mid-level trampolines, which means it may not offer quite as much bounce. Since safety should come first while still learning the ropes, we are confident in making this our choice for Best Intermediate Trampoline. It is well-built, extremely sturdy, and can handle extreme weather. It doesn’t have many extra features or special qualities that make it stand out from the crowd. It’s durability is certainly a strong point, but it does not otherwise distinguish itself compared to similar trampolines. It’s capable of creating powerful rebound effects for very high jumps. Its price puts it outside the reach of novices who only need a fun trampoline for the family. If you’re serious about your trampolining and want to invite your friends to use it, this could be the option for you. This affordable, well-built trampoline has a seamless net attachment for added safety. It doesn’t provide as much bounce as some other trampolines, and has a disappointing 200-pound weight limit. The mild rebound effect and added safety features make it a good choice for small children. Sportspower took safety seriously when designing this entry-level trampoline. The legs will have trouble standing up to years of use at the stated 220-pound maximum weight capacity. A good trampoline for casual exercise and children of various ages. It can hold up to 800 pounds, making it suitable for several jumpers at a time. Though users say it’s very sturdy, it has only four legs, making us worry about its stability under some circumstances. For the adventurous adult who doesn’t need a sport-level trampoline. It’s available in 7 different sizes, so you can select which one is best for your backyard. People have complained it just isn’t made for heavy, long-term use. A nice, affordable option for those who’ll only be using it occasionally. It has a small built-in basketball net, and you can buy additional game sets (like football and beanbag toss). The 200-pound weight capacity means many adults won’t be able to use it at all, much less together with their children. A decent choice for parents who would like something entertaining for the kids. Are you ready to really get down to the details? The following reviews take into account things like weight capacity, safety features, ease of use, construction, size, and more. We’d like for you to get an idea of what it’s really like to purchase, own, and use each of these trampolines, so that you can finally pick the one that suits your lifestyle best. Anyone who wants to enhance their trampoline fun with a game of basketball. People with more basic bouncing needs who don’t want to pay for extra features like basketball nets. As one of only two trampolines on our list with a basketball net included, our favorite feature of this Merax should be obvious. Before we talk about that, though, let’s first cover the basics. This trampoline has a set of six W-shaped legs that cover most of the circumference. It should do a fantastic job of supporting its 330-pound weight limit without wobbling. Its 72 springs may not keep the bounce going quite as long as others with up to 108 springs, since they’re likely to get stretched out more quickly from the increased force exerted on each one. These springs do have some things going for them, though. Since they are made from galvanized steel and protected against water, they should at least be able to resist rain and fog. Do you like playing basketball? If so, it’s no wonder that this trampoline has caught your eye. Thanks to its built-in basketball net you can play a bouncy game of H-O-R-S-E while burning 3 times as many calories! The safety net is supported by five padded poles; users agree with Merax that these are strong enough to provide all the support and safety you’re likely to need. The purpose of these poles is not just to hold the hoop up so you can keep the basketball inside the trampoline’s playing area. The safety net surrounding the trampoline is meant to keep people from falling over the edge when the play gets a little rowdy, and apparently does a great job at that. Although the net is designed to keep people off the springs, extra safety padding covers them for extra protection. This padding not only stops people from getting pinched between the springs if they lose their balance, it also helps to protect the springs from the elements. People who have bought one seem to really love this rather basic trampoline. The reviews and ratings they’ve given it are often excellent. Let’s remember, though, that this doesn’t imply that it’s superior to a more expensive model. It simply means that people are impressed at the quality they receive for the price they pay. The biggest concern about it seems to be that it has confusing instructions, and the same can probably be said for half of the things you own. Set aside a little extra time in case you struggle assembling stuff, but this trampoline’s value more than compensates for any frustration you’ll suffer while putting it together. It has a decent 330-pound weight capacity so multiple people can use it simultaneously. The springs are rust-resistant and covered with padding for extra longevity and safety. The basketball net makes fun activities other than bouncing possible. The poles that hold up the barrier net are padded and pretty sturdy. 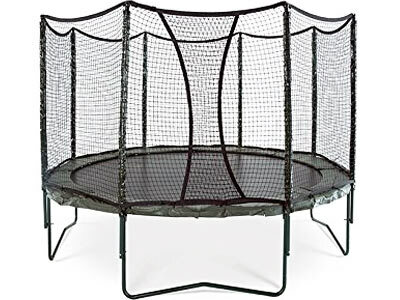 Some models of similar sizes have more springs, although a figure of 72 is pretty good at the price of this intermediate trampoline. You cannot adjust the leg height, so it has to be placed on a flat, level surface. Thanks to its built-in basketball net you can play a bouncy game of H-O-R-S-E while burning 3 times as many calories! Serious jumpers who don’t want to spend too much money. People who want to have multiple people on the trampoline together. We consider this one of the best advanced trampolines currently on the market. What is meant by an “advanced” trampoline, though? For one thing, it’s built to handle heavy, intense usage. It’s tougher, gives a better bounce, and is, all around, made from better materials than intermediate or beginner models. So, if you’re serious about trampolining, have a teenager who’s taking it or gymnastics as a sport, or just intend to use it on a regular basis over the course of many years, this is one of the trampolines you would do well to look at closely. We’d also suggest having a gander at the Acon Trampoline Air Sport HD and the JumpSport AlleyOOP VariableBounce – these are also built for advanced users. This trampoline is available in three different sizes, each with a different number of springs. The 12-foot round has 84 (more than you’ll find on the typical intermediate trampoline). The 14-foot round boasts 96 and the 15-footer has 108. Regardless of which size you select, it comes with durable zinc-plated, rust-resistant, 8.5-inch springs designed to ride out the years and give you some extra bounce. The springs themselves are outside of the safety net and, therefore, aren’t likely to be an issue while someone is jumping inside. It’s the safer solution. However, should somebody lean an arm on them while watching someone else bounce, getting a painful pinch is a real possibility. In this case though, the covered springs will give enough protection. The overall weight capacity for this trampoline is lower than that of the other two advanced models on this page. This implies that its springs and jump surface may not be quite as strong as those competitors, which you would expect from one of the least-expensive advanced trampolines. Unfortunately, even when you have your heart set on a high-end trampoline, there’s still a tradeoff between saving money and a high weight capacity. If you want to have four or more people using the trampoline at the same time, you’re going to have to pay a little more. If, on the other hand, you want a pretty capable trampoline for an affordable price (about half as much as the other advanced trampolines), this one could be perfect for you. Overall, consumer impressions of this trampoline have been very positive. Some users initially had complaints about the confusing way the instructions manual was written. The company stepped up and addressed the problem almost immediately, writing a completely new manual with simpler instructions. Apart from this and a few occasional problems, the experiences people have had are good. Consumers say it offers a lot of bounce, is fun to use, and well-built. As mentioned, you can find better backyard trampolines, but this one is very impressive at the price. Since the net is on the inside of the springs, there is an added element of safety. The 8.5-inch springs offer extra rebound for higher jumps. Six strong W-shaped legs provide stability. Comes with a 10-year frame warranty. The 330-lb weight limit is lower than many other advanced trampolines, but this one’s affordable price makes that less of a letdown. It’s built to handle heavy, intense usage. It’s tougher, gives better bounce, and is, all around, made from better materials than intermediate or beginner models. Small children who haven’t yet developed much balance or muscular strength. People with multiple kids who’d like them to use it together. Let’s begin by pointing out the obvious – this is a one-person trampoline made for small children. Unlike some other “children’s” trampolines (like the Sportspower My First Trampoline), this one does not have a high weight capacity and is not, by any means, made for adults. Its 100-pound maximum means that most grownups would actually risk injury if they were to use it. It is, however, perfect for small children who love to jump and bounce around indoors or outdoors. Safety is always a primary concern where trampolines are concerned, and is especially important when designing one for small children. Skywalker chose to include a well-padded bar for children to hold on to as they bounce, in case they’re not yet able to jump without support. This means that even children with poor coordination can safely use the trampoline to build leg strength and, most importantly, have fun. It doesn’t use typical metal springs like you’ll find in the others on this list. Instead, it uses a special elastic band system to create a gentle rebound effect, ideal for toddlers. Smaller bounces are safer and do not encourage children to try doing potentially dangerous maneuvers. Jumping on it is still fun, though, offering a great way for kids to expend excess energy and alleviate hyperactivity. So, if you’d like your child to entertain herself for a while, just pull out this trampoline and let her bounce away in a safe place where you can keep an eye on her. Since the entire trampoline is only 40 to 60 inches wide and weighs hardly anything at all, you should be able to set it up wherever and whenever necessary. Speaking of fun, Skywalker decided to increase the chance of creative play by adding lily pad graphics to the jumping surface. Your kids should have a blast pretending to be a frog jumping around in a pond. Returning to the question of safety, we’d like to point out that the elastic band system is also much safer than springs when children are outside the trampoline. Some injuries occur when little fingers find their way in between the spirals of metal springs. This is one of the reasons that spring trampolines often include a soft padding over the top of the springs. Using the elastic system on this trampoline completely removes the risk of such tearful pinches. The jumping surface is specially designed to reduce the chance of slipping and increase safety. It uses elastic bands instead of springs for a gentler bounce and less risk of pinched fingers. Lily pad designs add some extra fun to the trampolining experience. A child can hold onto a padded bar while bouncing. Only one child can use this trampoline at a time. Its maximum weight capacity won’t support an average adult. It uses a special elastic band system to create a gentle rebound effect, ideal for toddlers. Smaller bounces are safer and do not encourage children to try doing potentially dangerous maneuvers. Anyone who wants extra safety features in a high-quality trampoline for recreational use. Those who need a trampoline with a very high weight capacity for shared use by adults. It didn’t take long for us to choose this as our favorite intermediate level trampoline. One reason for this is because it has one key trait that makes it stand apart from most others – its legs. If you’ve read through the buying guide below, you’ll already know how much we appreciate W-Shaped legs on trampolines. W-shaped legs offer superior support by dispersing weight and force, even on uneven, soft surfaces like grass. Such legs are themselves also more durable and reduce the strain on the jumping mat, helping it last longer as well. This trampoline steps safety and stability up a notch. Instead of using only its W-shaped legs, it also has straight legs that extend down along sides of each W-shaped leg. These aren’t there to support the main frame, though; they are meant to support the safety net. Most safety nets are supported by the same poles that attach to the frame of the trampoline, making this protective feature much more reliable in comparison. Special connectors link the two kinds of legs to each other, too, offering even more stability to both the net and the trampoline as a whole. Safety is further improved by a padded mat covering the springs, so if safety is something that concerns you (and we’re thinking of parents everywhere now), this trampoline is not a bad choice. An even better choice might be Zupapa’s Safump though, because the net is inside of the spring cover to prevent any possible contact with the springs. The 15-foot wide version of this trampoline has a perfectly adequate 375-pound weight capacity. If you’re looking for a trampoline that’ll support four or five adults, though, you’ll either need to upgrade your price range or lower your expectations. If this describes you, you could have a look at the “advanced” trampolines we’ve included on this list, like the Acon Trampoline Air Sport HD or the JumpSport AlleyOOP VariableBounce. Consumer reviews of this trampoline have been overwhelmingly positive, both from experienced trampoliners and people who only want a fun, mid-range toy to play with. It comes with a cover so that you can leave it outside without worrying that sun and moisture will damage it. For extra longevity, UV protection has been added to the synthetic materials. The ladder makes it easier to get on and off this trampoline. A unique frame arrangement provides extra support while you jump. You can purchase an “assembly” option as well, which means someone will come and set it up for you. It’s more expensive than some other intermediate trampolines. It appears to have smaller springs than some of its closest competitors. This trampoline steps safety and stability up a notch. Instead of using only its W-shaped legs, it also has straight legs that extend down along sides of each W-shaped leg. People who live in areas with extreme weather and need a sturdy, workaday trampoline. Anyone who wants to bounce high on a trampoline with a lot of rebound energy. As you’ve probably figured out by now, the more springs, the better if jumping performance is important to you. Since weight and force are distributed among the springs, fewer springs mean that more weight and force is exerted on each, causing them to stretch out and lose their effectiveness much more quickly. With a respectable 72 springs on the 12-foot model and a more impressive 108 springs on the 15-foot one, this trampoline shouldn’t suffer from degraded performance any time soon. The springs themselves are also built to last longer than some cheaper alternatives thanks to their rust-resistant coating. On the downside, they are only 7 inches long, making them both less powerful and not as long-lived. Compare that figure to the 10-inch springs on the Acon Trampoline Air Sport HD and it’s clear which one will give you more bounce for longer. However, some people aren’t looking for a lot of bounce. It’s also possible that you don’t want to encourage your children to try doing backflips or achieve the heights they could using something like the Acon. If you prefer a well-built trampoline that offers a more sedate experience, this is a good place to start. There aren’t very many things that make this trampoline stand out from the others we’ve selected. On the other hand, keep in mind that these are all premium, highly popular brands known for satisfying their customers. However, being a middling product offering decent value isn’t necessarily a drawback. A lot of people aren’t looking for an extravagant trampoline with extra features or incredible rebound for Olympic-level training – they just want something simple. When faced with so many options, it’s difficult to know which one to buy. In this case, a top-selling model with a very sturdy construction might be just what is needed. Unlike some of its competitors, this trampoline is pretty easy to put together, while customers are generally quite pleased with the company’s customer service. Importantly for people living in areas with fickle weather, it comes with a rain cover, is resistant to damage from sunlight and tough enough to survive tree branches blown down by heavy winds. It comes with a rain cover that will help it last longer outdoors. The rust-resistant, galvanized steel frame will stand up to outdoor elements and the test of time. The ladder makes it easier to climb on and off this trampoline. The 12-foot option has only 4 W-shaped legs, which means it may not be as stable as some other models. With a respectable 72 springs on the 12-foot model and a more impressive 108 springs on the 15-foot one, this trampoline shouldn’t suffer from degraded performance any time soon. People who will use their trampoline for sports training. Families looking for a basic trampoline for younger children. Are you looking for a high-quality trampoline built to create extreme bounce for multiple jumpers? Are you interested in trampoline acrobatics, or want to use one to improve your skills at something like diving or water skiing? Do you want to push your limits and aim for a high-intensity, full-body workout? If you answered “yes” to any of those questions (or if someone else in your household would), this is possibly the best trampoline for your needs. One of the most noticeable differences between this trampoline and most others is its rectangular design. You may be surprised to hear that rectangular trampolines create a lot more rebound than round ones, which is why nearly all professional, competitive trampolines are rectangular in shape. Most backyard trampolines, however, are round. This is understandable, as most of us don’t really want to jump very high, or allow our children to do so (competitive trampoliners often top out at over 30 feet). Round trampolines are also more forgiving when you land off-center. Acon went in a different direction with this model, though, appealing to the daredevil inside you. The decision to go with a rectangular configuration automatically boosts its bouncing power. Add to this equation its 10-inch long springs, which are unmatched for length on our top-11 list, and you have a trampoline that should satisfy almost any athlete. We have to be honest here. If you want quality like this, you are going to have to pay more for it. For example, another advanced trampoline on this list is nearly as powerful, but cannot support the same amount of weight. The SkyBound Stratos Trampoline can hold only up to 330 pounds, whereas this one can hold 800 pounds (yes, that much). It is also half the price of this trampoline. Which is the better choice depends on a balance between your budget and your intended uses. Since this trampoline is capable of supporting up to 800 pounds, you can share it with other people, although, at only 10 by 17 feet, this might get a little crowded. Mostly, this impressive weight rating is an indication of this high-end trampoline’s durable construction, including the frame, mat and springs. Its rectangular design means that it creates a larger rebound with every jump. The 10-inch springs add additional power for higher bounces. It comes as large as 17 feet long, or smaller if you prefer. It can support up to 800 pounds so you can share the fun with friends. Ringing in at the top of our list for prices, this trampoline may be too expensive for some people. This trampoline appeals to the daredevil inside you. The decision to go with a rectangular configuration automatically boosts its bouncing power. Add to this equation 10-inch springs and you have a trampoline that should satisfy almost any athlete. Parents with smaller children or people who intend to use it for one adult at a time. Anyone hoping to reach great heights on each bounce. This isn’t the first Skywalker trampoline on our list, nor in fact the last. Skywalker is a popular name in the trampolining world, known for the quality of their work. Available in three different sizes and four different colors, this trampoline should suit almost any backyard. Its thick, galvanized, rust-resistant steel frame will stand up well to outdoor weather. Also, its safety netting is held firmly in place with steel poles connected using strong t-connectors. One of the best features of this trampoline is its seamless netting. On many other models, the net connects to the frame, jump surface, and spring area with clips, clamps or zippers. These designs leave gaps and spaces where arms and legs can slide underneath the netting, potentially causing injury. This trampoline doesn’t carry this risk, making it a good choice for entertaining younger children. There is a clear downside to this trampoline, though, which we suspect explains why it is so affordable despite its quality construction and safety features: it has only a 200-pound weight limit. That means that this probably isn’t a trampoline you can share with your children or even use by yourself. Remember that this maximum figure is the highest safe weight and not something to strive for: crowding it will reduce the lifespan of your trampoline significantly. If your children are young, though, and you don’t plan to use the trampoline yourself, it could be a good, well-priced option for you. Consider this – if your kids are between 4 to 9 years old you’ll probably need a new trampoline, anyway, by the time they outgrow its weight limit. Overall, consumer feedback on this trampoline has been positive. Some people have reported minor issues with setting up the frame, but assembly seems to be a common complaint when it comes to home trampolines. Some consumers have complained about the fact that it isn’t as elastic as other trampolines, but this is only to be expected in one intended primarily for kids. The 5.5 to 7 inches springs (depending on the overall size of trampoline you purchase) are pretty short compared to top-of-the-line trampolines like the SkyBound Stratos Trampoline and the Acon Trampoline Air Sport HD. Shorter springs mean less rebound, which means that you don’t bounce as high. In the case of children, this allows them to have their fun, but will discourage them from trying somersaults and other possibly dangerous stunts. The seamless safety netting improves overall safety. You can choose among 4 different colors for the padding that covers the springs. It’s built from high-quality materials. The short springs make for less of a rebound, but this many be better for children. Its weight limit is a mere 200 pounds, so it’s really not for adults. One of the best features of this trampoline is its seamless netting. On many other models, the design leaves gaps and spaces where arms and legs can slide underneath the netting, potentially causing injury. This one doesn’t carry this risk, making it a good choice for entertaining younger children. Parents who want to use their child’s trampoline for exercise themselves or want to hold their hands as they learn. People with teenage children who want to trampoline with their friends. This trampoline is best for children in our opinion, but that probably won’t stop some adults from hopping on. And why not? Its 220 pound weight capacity means that multiple children can use this trampoline together without overloading its surface. It also means that a single adult can use it, though probably not too vigorously. A parent and child may even be able to use it together, depending on their combined weight. We’re not saying that this is a trampoline for adults; after all, you only have to look at it to see that it’s designed for children. But if you want to do some mild bounce aerobics while your child is napping, hop on! The only difficulty you may face would be getting on and off this trampoline. Since the safety netting is secured directly onto the trampoline, you have to use the opening to get in and out, which is sized for children. That being said, the seamless safety netting is good from a safety perspective. You may recall that we were enthusiastic about this kind of design on the Skywalker and Skywalker Jump N’ Dunk Trampolines trampoline we reviewed prior to this one. What makes a seamless net so great is that you can’t get fingers or limbs caught in it if you fall or slip while jumping. The safety padding on top of the springs is also stitched directly to the trampoline. Is Your Child a Toddler? If you’re looking for something for young children, this is our favorite pick for you. The safety netting is excellent, the net poles are well padded, and the rebound is sluggish enough for small, safe bounces. If, however, you want something for a toddler who’s still developing her balance, we want to direct your attention to the Skywalker Mini Bouncer that we reviewed further up this page. Though we love this particular trampoline, it’s simply not made to support the needs of a toddler who isn’t very stable or coordinated. The padded safety bar on the Skywalker offers extra stability for toddlers who choose to grab onto it. The seamless netting makes this a very safe child’s trampoline. The jump mat and the safety padding over the springs are also seamless. The 220-pound weight limit means that you can use this trampoline yourself. It may be difficult for adults to fit through the safety net’s opening. What makes a seamless net so great is that you can’t get fingers or limbs caught in it if you fall or slip while jumping. The safety padding on top of the springs is also stitched directly to the trampoline. Adults who want to share a trampoline. Advanced users who want extreme rebound bounce. If you’re looking for a high-quality, advanced trampoline which falls somewhere between the SkyBound Stratos Trampoline and the Acon Trampoline Air Sport HD, this is it. Though it doesn’t incorporate quite as many springs as the Acon, it is built to similar specifications. Just like the Acon, it has an 800-pound maximum weight capacity. Multiple people can jump around on this trampoline without worrying about overloading it. Few other domestic trampolines can claim to support as many as four average adults. We’d suggest this trampoline for anyone with a large family who wants to use it for recreational purposes and needs a high maximum weight capacity. If you’re looking for exceptional rebound and want to train for sports, you might be better off considering the Acon Air 16 Sport, which is better equipped for those needs. For a trampoline in this price range, we’d really like to see more than 4 W-shaped legs. Six would make us most confident in its overall strength and stability. Despite our own reservations, though, users rarely complain about the legs. Consumers have reported that the trampoline feels safe and sturdy when in use. Most complaints center around setting it up, which is far from an uncommon issue. Unfortunately, assembling most kinds of trampoline isn’t likely to get much easier any time soon. Another nice feature of this model is the doorway. The safety netting overlaps here, so that you have to squeeze your way through instead of opening and closing a zipper or Velcro door. Parents are often concerned about other types of doors, since children often forget to close them or the fasteners break, leaving a gaping hole in the side of the netting where kids can fall out. This “unforgettable” door cannot be left open, making it one of the safest netting systems on the market. Consumers say that it’s very stable and sturdy. It has a very respectable 800-pound weight capacity. The overlapping doorway cannot be left open. It has only 4 legs, where most others its size come with 6. There isn’t a larger 15-foot size option. Multiple people can jump around on this trampoline without worrying about overloading it. Few other domestic trampolines can claim to support as many as four average adults. Someone who needs a fairly basic trampoline in a very specific size. Anyone who needs a trampoline for heavy-duty use. Are you looking for a trampoline but can’t find one that fits exactly into a particular space? If your backyard play space isn’t very large but you want to make the most of every square inch, you’ve probably thought about getting a trampoline that was eight, ten, or even 16 feet in diameter. With typical diameters being 12, 14, and 15 feet, this Exacme trampoline breaks the mold by offering numerous size options. There are actually 7 options in total for you to choose from; interestingly, all of these come with 7-inch long springs. Most other companies vary the spring length depending on the overall size of the trampoline. The Skywalker’s 10-foot trampoline, for example, has 5.5-inch springs whereas its 15-foot option uses 7-inch springs. What does this mean? The typical 7-inch spring gives a lot more rebound than a similar spring measuring 5.5 inches. If you compare the experience a 15-foot trampoline offers with that of a 10-foot one, therefore, you’ll normally notice a significant difference. Instead, Exacme products offer a very similar, though average, bounce regardless of their size. What does change along with their size, though, is the number of springs each has. Topping out at 108 springs on the 16-foot model, this trampoline has more than enough springs per square foot to support the mat. We’re also impressed with this trampoline’s maximum weight capacity. Though this pales in comparison to the 800-pound limit on the AlleyOOP and the Acon, the 225 to 398-pound maximum is very impressive considering the price of this intermediate-level trampoline. It has a pretty high maximum weight capacity. There are numerous different sizes to choose from. It comes with 7-inch springs regardless of the size. The net has its own legs for added stability and safety. Its construction reflects its price, not being suited to heavy, long-term use. If you compare the experience a 15-foot trampoline offers with that of a 10-foot one, you’ll normally notice a significant difference. Instead, Exacme products offer a very similar, though average, bounce regardless of their size. Parents who want to be able to purchase more accessories for their kids trampoline. Adults who want to get in on the fun and games. When you get right down to it, there’s only so much you can do on a trampoline, especially if acrobatics aren’t for you. If you’re looking for a little extra fun and don’t want to compromise on quality in order to get it, you’ll be glad to know that the Jump and Dunk was designed especially for spring-loaded ball games. This means that you’ll probably have to get out of the netted structure time and again to retrieve runaway balls. The safety net will stop some balls from getting away, but it’s not high enough when a springy ball bounces on a moving surface. Thankfully, the basketball net’s opening will only support a small ball, not the typical NBA-sized ball. We recommend using soft balls only, both to avoid injuries and to prevent them from flying out every few seconds. You may be wondering why we selected this as our favorite with a basketball net over the similar Merax. In simple terms, it came down to customer experience. The Merax just isn’t as popular among its users as this Skywalker. This trampoline is not only enjoyed more, it’s also more popular as far as simple sales numbers go. This might simply be because of the general reputation of the Skywalker brand: though Merax is a well-known company, they just haven’t made quite as much of a name for themselves in the trampoline world as Skywalker has. It should also be said that Skywalker focuses exclusively on trampolines, while Merax are generalists. Another awesome thing about this Skywalker trampoline is the extra fun you can have with them. This one comes with a basketball net as standard, but you can also purchase additional accessories to create more, equally energetic games. In fact, you can also purchase these for any of the Skywalker trampolines on our list. These accessories include bullseyes, a game net that goes beneath the trampoline, mesh pouches to hold game pieces and shoes, football games, and LED lights. It comes with a built-in basketball net. You can purchase additional accessories to expand your gaming options. Customers are very happy with their Skywalker purchases. It has only a 200-pound weight capacity, making it suitable only for children. The smallest size has 5.5-inch springs that won’t offer much rebound. Not all trampolines are identical, and the best way to illustrate that is by looking at the feature table below. It’s also a great place to start your search for a new product, because if there’s a particular feature that you don’t want to do without, this is the place to check if your preferred trampoline has that option or not. Different people have different needs when it comes to trampolines. Let’s be honest – some people just want something their kids can bounce around on, whereas others are looking to get some exercise themselves and perhaps practice acrobatics, even competitively. It therefore pays to know about the capabilities and limitations of each – and, of course, how large a dent it will make in your wallet. A lot of people mistakenly assume that a trampoline’s elasticity somehow comes from the jump surface. Trampoline mats, being made of woven nylon (or other another synthetic material), have a little bit of “give” when stretched, but that pliability mostly serves to make each jump safer and more comfortable. When it comes to bounce, the springs are what you should be thinking of. You will have noticed that spring length also plays a role. All things being equal, you’ll feel more elasticity with longer springs. This is because long springs stretch further when you land on the jump surface, meaning that they push you upward over a longer distance, propelling you further into the air. Obviously, bigger trampolines need more and longer springs to make up for the larger surface area. When checking on the springs of your trampoline choices, also look out for words like “galvanized steel” and “rust-proof” in the stats. If you don’t see these words, there is a chance that they won’t last very long, especially if the trampoline is left outside. If you’re just looking for something inexpensive, this shouldn’t matter much. However, if you’re serious about your trampoline workouts or want it to last five to ten years even when exposed to the elements, this is a feature you shouldn’t neglect. Trampoline legs should be W-shaped and wide-set for the best stability and durability. Post-style legs are okay for small trampolines which will only be used by children, but you should still be conservative when thinking about the maximum weight capacity of any trampoline. Every time you jump, the structure has to absorb the force of a human body falling from a height of perhaps several feet, so having a sturdy base structure is key to safety. This is another area where you should pay attention to terms like “galvanized,” “weather-proof,” “rust-resistant,” and “zinc-coated.” All of these point to increased longevity and durability, which make your trampoline safer once it has a few years on it. Stainless steel is the best material commonly used for trampoline construction, so it may be preferable to pay extra for one of these rather than one with a frame made of something inferior. Always place your trampoline on a flat, level surface without obstructions nearby.. If children will be using it, always purchase a trampoline with a safety net and padding over the springs. Inspect the trampoline and surrounding area before every use. Remove all jewelry before using the trampoline. Extra care should be taken when more than one person is using the trampoline simultaneously, as collisions can easily lead to injury. Several of the trampolines you’ll find here have weight capacities far below this suggestion, but these are geared toward small children or single adult users. If you want to share this trampoline with your kid or friends – or a group of teenagers might want to use it – find something with a high weight capacity. If you’re looking for something in the 14 to 16-foot range, we suggest finding a trampoline with 6 W-shaped legs for the best possible support. Initially, trampolines were seen as training and exercise aids, though they soon became a source of amusement and fun. If you want a larger trampoline that’s able to support multiple people, you should aim for one with at least 84 springs to avoid stretching or breaking springs prematurely. Want to spend less time exercising? A mere 10 minutes of jumping on a trampoline can substitute for a 30-minute run, saving you time without compromising on your workout. There are trampolines made especially for people with small backyards or indoor spaces. The “beginner” trampolines on our list (such as the Skywalker Trampolines Mini Bouncer Kids Trampoline and the Sportspower My First Trampoline) are of this type and suitable for use by a single person. They are, of course, small, often measured in inches instead of feet. These are perfect for people who want to introduce small children to the sport of trampolining without committing a lot of space or money to the project. If you’re looking for a basic trampoline for your young ones to play on, you can also go for something at the intermediate level. These may not have the best springs, but should give them enough bounce to have a good time. That being said, each trampoline has a weight capacity you should pay attention to. Though higher weight capacities usually come with higher price tags, these are the safest choice for people with multiple children or whose children like to invite guests over. Since rectangular trampolines are known to give a little extra boost to your bounce, it’s best to choose a round option for small children. Dampening the height they can achieve will help prevent them from trying to do flips and potentially injuring themselves. In our review for the Skywalker Mini Bouncer, you’ll also find two additional ways to ensure the safety of younger children. Typical metal springs can cause injuries, as small fingers can easily find their way in between their coils. Elastic-based springs are much safer. Another thing to consider is that if the trampoline is for a toddler, it should have a safety bar or railing for the child to hold onto as he or she jumps. A padded bar (like that on the Skywalker Mini Bouncer) helps small children strengthen their little legs without falling. What if, however, you’re not looking for something for your children to play on? What if you want to get some exercise for yourself? Alternatively, one of your kids may be serious about competitive trampolining or a sport it’s used to cross-train for, such as gymnastics. In this case, you should look for a high-quality trampoline such as those that we call “advanced” in our statistics table. The more money you spend on a trampoline, the better the chance that you’ll get one of superior quality. This really is one kind of product where you get what you pay for. What makes a trampoline advanced, though? The following are the basic traits you should look for if you are serious about your trampoline’s performance. Choose one with at least 84 springs if the trampoline is 12 feet or more in diameter. A rectangular trampoline will give you a higher bounce, so these are best if you’re planning to do backflips and other cool tricks. Select one with a weight capacity of over 300 pounds. Even if you weigh far less than this, having a high weight capacity will allow you to jump higher without fear of damaging the springs. If you’re really serious about this sport and aim for Olympic level jumping like the athlete above, the trampolines featured on this page won’t make the cut. We recommend taking a look at a website like Max Air Trampolines if you want to practice at this level. Although not the most complex machines in the world, trampolines aren’t nearly as straightforward as people think. Quite a lot goes into designing them, building them and selecting the right one for what you plan to do with it. As always, we want to remind you to focus on your actual needs when making this purchase. Ask yourself: how many people will use it? What kind of space can you fit it in? What will they use it for: recreation? Cross-training? Exercise? Once you’ve narrowed down your options through questions like these, start to consider how long you would like to own your trampoline. This will impact the price you’ll have to pay, so think about your maximum budget as well.